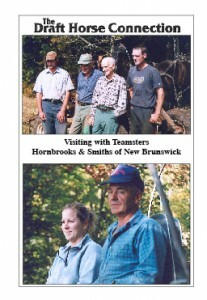 Visiting with Teamsters Hornbrooks & Smiths of New Brunswick you will meet two very diverse, close knit families who believe a good day’s work for horses, whether in the field or the bush is important to having well trained horses that will stand either in the bush, hooked to farm equipment or in the show ring. Both families raise registered Percheron horses & they are well known for their expertise in farming and showing horses. Melbourne & Wendy Smith raised their two daughters, Meredith & Meghann on Melbourne’s Dad’s farm. The Smiths use horses around the farm to plow, disc, harrow, spread manure, bush work, wagon treks, sleigh rides & wagon rides for special occasions. Both daughters have been working & showing horses since age 5. In this video Melbourne & Meredith take us for a wagon ride, & Melbourne, Wendy & Meredith share their love of horses as well Melbourne explains in details proper fitting of harness and the use of twinneck yokes. The Hornbrook family – James, Ron, Adam, Matthew a sixth generation family with the seventh generation children becoming a part of their full time farming operation. The Hornbrook’s farm consists of dairy/beef cattle, ewes, sows & 40 horses, of which 35 are Percheron horses. All members of the family work closely together. Adam demonstrates his 13 HP Honda motor logging cart he designed for use in the bush. Matthew hooks a Percheron team to a set of out throw discs. You will enjoy the interviews with each member of these unique families as they share their backgrounds, working with horses on the farm & in the show ring. The Hornbrooks and Smiths are skilled teamsters with a wealth of knowledge to share.